Elevate your lifestyle at Avana La Jolla Apartments. Set under mature palm trees and tall California pines, our San Diego, CA, apartments for rent near the beach are designed to inspire your sense of wellbeing. Our apartments are housed in charming white stucco buildings with red tile roofing in the style of Spanish Colonial Revival architecture. Featuring five unique and spacious floor plans, you can find the space that fits your life. Each of our homes offers a beautifully appointed kitchen, featuring high-end stainless-style appliances, a convenient dishwasher, and sleek modern cabinetry. To ensure you always look your best, our apartments also provide an in-home washer and dryer as well as generous walk-in closets. Five Distinct Floor Plans Ranging From 687 sq. ft. – 981 sq. ft.
To create a relaxing environment, Avana La Jolla Apartments offers a collection of premier upgrades and luxurious finishes. 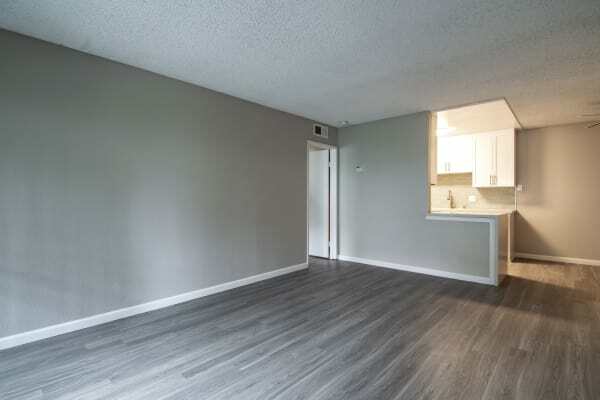 Our San Diego, California, apartments for rent feature five unique floor plans ranging from 687 sq. ft. – 981 sq. ft. Our homes boast handsome dark wood-plank flooring, designed to enhance a variety of design aesthetics. Each of our luxury living spaces also offers a private balcony or patio where you can cultivate a potted herb and vegetable garden or enjoy a cup of coffee with your favorite book on a slow Sunday morning. Find your fit at Avana La Jolla Apartments. Call today to schedule your tour of our San Diego, CA, apartments for rent near Torrey Pines.